The travel recommendation site's problems just keep getting worse. TripAdvisor Inc (NASDAQ:TRIP) stock has been heading south for so long it may never see this side of the equator again. The travel-recommendation specialist has been sliding since 2014 as a shift in its business model failed to deliver the expected growth, and instead, profits have struggled as its key hotel segment is losing sales due to the shift from desktop to mobile sales and the company's fraying relationship with key partners like Priceline Group (NASDAQ:BKNG). Still, a base of investors has stuck with TripAdvisor through these trials and tribulations, citing reasons like the company's unique platform and its dominance in travel recommendations. On Motley Fool CAPS, TripAdvisor rates four stars, meaning the majority of investors believe the stock will go higher. Most base this belief on the fact that they think the shift to a more direct model will eventually pay off, or mobile monetization rates will grow. However, there are a number of reasons the stock is likely to continue suffering. In 2014, TripAdvisor launched Instant Booking on its mobile app, putting it in direct competition with online travel agency giants like Expedia (NASDAQ:EXPE), its former owner, and Priceline. The platform was a key component of the company's pivot away from its ad-driven model as the company said at the time Instant Booking would remove friction from the mobile booking process and "provide a more efficient hotel booking experience." The following year, the company made it available on all platforms, but by 2017, it's become clear that Instant Booking has not been the revenue stream the company had hoped it would be. It began downplaying the Instant Booking feature on its website earlier this year as competition in the travel booking industry proved to be more intense than they thought. Furthermore, the company has fallen short of its guidance a number of times, causing the stock to slide steadily over the last three years. While modest revenue growth has returned after a brief dip in sales, profits continue to fall as earnings per share have declined in every quarter but one over the last two years. Through the first three quarters of this year, GAAP earnings per share have been nearly slashed in half from $0.81 to $0.46. In comments on its most recent earnings report, management said "ongoing changes in traffic mix toward lower-monetizing mobile devices and paid marketing channels, competitive dynamics, bidding volatility in our click-based auction and macroeconomic events" were all factors that were outside of its control as affecting its ability to provide guidance. Indeed TripAdvisor isn't the only travel stock that has struggled lately. 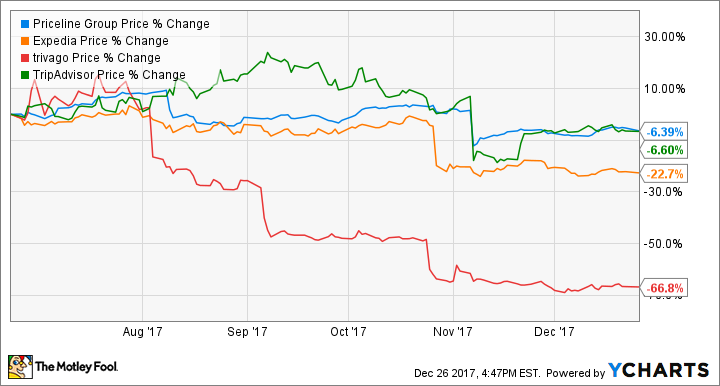 As the chart below shows, all four of the publicly traded OTA stocks have slipped over the last six months. Trivago (NASDAQ:TRVG) has gotten hammered as Priceline has pulled back on referral traffic and de-emphasized meta-search, but that strategic choice also seems to be weighing on TripAdvisor as Priceline's visibility in TripAdvisor's top search spots fell from 63% in June to just 10% in September. That might help explain why TripAdvisor stock plunged after its third-quarter report as guidance was particularly woeful. Beyond the challenges from Priceline, the rise of Airbnb could also rewrite the rules in the travel industry, and Alphabet is also angling for a position in hotel booking and search. In its most recent earnings report, management said it expected click-based and transaction revenue growth would slow further in the fourth quarter, and that those trends as well as "associated performance-based marketing spend" will continue next year. Investors, therefore shouldn't expect much of a comeback in 2018. In fact, analysts see adjusted earnings per share falling modestly from $1.11 this year to $1.07 next year. That gives the stock a P/E of 32 based on next year's earnings, meaning there's still more room for shares to fall, especially if the company continues to miss the mark. Given the headwinds in the broader online travel industry and management's inability to develop an effective booking platform, there seems to be little reason to expect a recovery in TripAdvisor shares anytime soon.